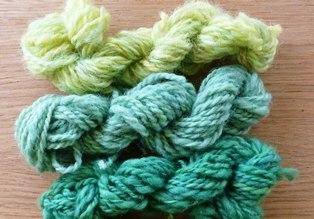 I have been doing more natural dyeing with Louise Spong of South Downs Yarn, (see link on the right of the home page), this time focusing on greens. 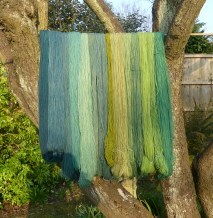 The photo below shows a range of green shades from one of our dyeing sessions. Although green is the most common colour in nature, producing green from natural dyes is not as straightforward as one might expect. 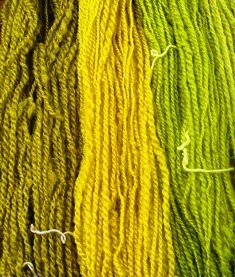 Mossy greens can usually be achieved by using an iron modifier on yellow-dyed yarn and using a copper modifier on fibres dyed with plants such as weld often gives lime green. However, a true grass green is almost impossible to obtain from a single dye and has to be achieved by dyeing blue over yellow or vice-versa. The photo below of colours from weld shows from left to right: weld + iron modifier, weld with no modifier, weld + copper modifier. There are numerous sources of yellow but indigo is the only reliable source of true blue. I tend to prefer to dye yellow first and then use the blue dye; I feel this gives greater control over the final colour because the indigo blue can be added gradually by dipping the fibres in the vat several times. If the vat is weak and each dip is brief, the green colour can be built up gradually until you reach the desired shade and depth. Some dyers prefer to start with blue fibres and then over-dye them with the yellow dye and this also gives good results. The shade of yellow determines the shade of green. Dyeing blue over a bright clear yellow gives grass green; mustard yellows tend to produce mossy greens, whilst over-dyeing pale yellow or a beige yellow often gives a turquoise green. It is also important to remember that most yellow dyes require a mordant, in which case the yarn you use will need to be mordanted even though indigo does not need a mordant. Yellow dyes that do not require a mordant include rhubarb root and saffron. However, saffron may be considered too expensive to use in the dye pot, although about 5% should be enough to achieve a reasonable yellow.. The photo above shows the development of turquoise green from pale yellow over-dyed in indigo. Later in the year I shall be writing an article on dyeing greens for the “Journal for Weavers, Spinners & Dyers” and this will give more information and include several photographs.